Adult Diagnosis: Adults from this family can be distinguished by the tymbal organ on the metathorax used to create ultrasonic sounds. They have a wingspan of about 7.5 cm (3 inches), with black forewings containing complex white veination. Hindwings are typically orange, pink, or yellow with black patches. The abdomen is the same color as the hindwings, and has black spots down the median. The unique pattern and color of the wings has given this group the common name of Tiger moth. Adult/Larval Natural History: Larvae of this species overwinter, and the caterpillars are dark with white marks, covered with rigid hairs. They have a "hairy" look, and are often referred to has woolly bears or woolly worms. The patterns and coloration of this species serves as warnings of their toxicity. Adult moths are active at night and can be found near light sources. Found in Canada and eastern U.S., they are commonly seen in fields and woodland edges during the summer months all the way to September or October. Though abundant in these areas, they are usually not of economic importance when dealing with crop damage. Distribution: The species is widely distributed in Kansas. It is widely distributed in the United States, but not as common in the southern areas and not found at all in the far west areas. Habitat: Both adults and larvae can be found in open fields and woodland edges. Adults can typically be found at night near light sources. Diet: Caterpillars are general feeders, eating leaves dandelions, thistles, and ironweed. Adults have siphoning mouthparts and feed on nectar. Conner, W.E., N.L. Jacobson, S.J. Weller. 1999. 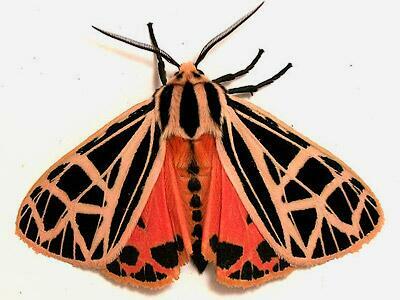 The Evolution of Chemical Defences and Mating Systems in Tiger Moths (Lepidoptera: Arctiidae). Biological Journal of the Linnean Society 68: 557-578. Conner, W.E. 2009. Tiger Moths and Woolly Bears: Behavior, Ecology, and Evolution of the Arctiidae. Oxford University Press, New York, NY. Donahue, J.P. 1993. Six Species of Tiger Moths (Arctiidae: Lithosiinae, Ctenuchinae) New to the United States Fauna, with Notes on Their Nomenclature and Distribution in Middle America. Journal of the Lepidopterists’ Society 47(3): 199-210.